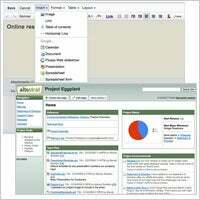 Our comprehensive review of the search-engine giant's battery of web-based tools. In case you hadn't noticed, it's not Bill Gates' world any more. Sure, Microsoft remains the dominant office software provider, with 450 million deployed users, according to data from the company. But its downcoast rival, Mountain View, Calif.-based Google, has broken Microsoft's lock on office software products. 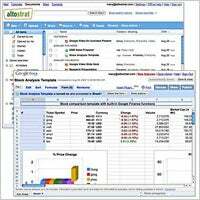 More than 2 million firms and 25 million users now handle their e-mail, documents and other office tasks using Google's web-based professional office suite, Google Apps. Google's office tools offer a mind-boggling array of cloud-based productivity options to even the smallest firms: Essentially everything you do at work is now available anywhere, anytime, from any online connection. Better yet, it's all free for the standard version--or $50 per year per user for the Premier version, which includes additional storage and high-quality, unlimited support. And Google is just getting started. In April the company quietly overhauled Apps, dramatically changing the user interface and upgrading the core code of the software. The new Apps supports development by third parties though the Google Apps Marketplace. If you don't have good web access, you are better off working with traditional word processors like Microsoft Word or OpenOffice. But if you use the internet and your firm is not Google Apps-savvy right at this very second, you are making a mistake. What's to love: The cornerstone of any small-business venture, Google Apps Gmail supports your company's URL and looks the same from any web browser or mobile device. For example, it instantly turns even an iPod Touch into a work portal. Plus, Gmail has plenty of room for every employee's work e-mail, with 25 GB of storage per user (with a paid Apps account). Employees have complete remote access, and the system requires them to log in to do their work, for total accountability. Gmail conversations are "threaded," unlike most desktop e-mail clients, which means e-mails are grouped by similar subject lines, making it simpler to track intricate, multi-party exchanges. What's to hate: Google's approach to logging in and managing various e-mail identities is needlessly complicated. Worse, employees often have trouble telling whether they're logged in to the company's virtual e-mail system or their own personal Gmail account. Also, be prepared to be bombarded by ad-supported content. Text ads are Google's main business, so you're pretty much always looking at them. Some may be relevant, but many businesses will be wary about opening their private company e-mails to marketers, even if anonymously. Productivity factor: Tremendous. 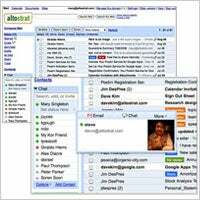 If you're not using a Google Apps Gmail account in tandem with Microsoft Outlook, you're either a newbie or a fool. But be forewarned: It's not a complete substitute for Outlook. What's to love: Apps Calendar creates a common platform on which to schedule appointments and events throughout your entire business in real time. It lets assistants schedule executives' appointments from a remote location, and it lets your clients update meetings as they need to--again, as it happens. 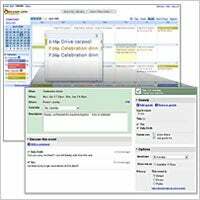 Quite simply, when it comes to group events, it's the scheduling tool of the gods--it even generates e-mail invitations that include a button to respond. When employees indicate they will attend, Apps Calendar automatically adds the shared meeting to your schedule and theirs. It also lets you merge employees' calendars with yours in order to manage your whole team's time with a bird's-eye view. What's to hate: Like Apps Gmail, Calendar can be confusing and complex; managing Calendar Settings is the devil's work. And you can expect to deploy another project management app like Smartsheet or LiquidPlanner to really make scheduling work. Also, managing permissions and privacy has been difficult in our testing. And, of course, different people manage their schedules in different ways. Be warned: Integration with Outlook is futile. Productivity factor: There's no other tool out there like it. The scheduling features alone are a must-have for small businesses. Just don't ask it to do too much. What's to love: Google Docs gained the most in the recent Google Apps rebuild, which solved most previous problems regarding connectivity and collaboration. Offline content creation can actually work. Its collaborative word-processing features, which let multiple parties make revisions simultaneously, are a revelation for any fast-moving creative team. Suddenly, creating a proposal or a presentation is an almost-weightless task. Forget writer's block: Real-time chat and comments put the group's feedback right on the page, and changes are saved automatically and often. You'll never look at writing or editing the same way again. What's to hate: As cool as it is, Google Docs will not replace Microsoft Word or OpenOffice when it comes to producing slick, professional-looking documents. More troubling, connectivity can still be an issue, a scary prospect when Docs freezes up in the middle of saving a document. And forget about using the wildly unreliable e-mail attachments and publish-to-web features; both can be unstable. Productivity factor: Docs rocks. It's simply the best collaborative work tool on the market--and you can't beat the price. What's to love: Though technically not part of Google Apps, AdWords still is an integral part of any growing business's basic marketing strategy. It forces a firm to boil its value proposition down to a sentence and makes you responsible for how you follow up on leads from your website. What's to hate: Don't spend more than $100 a month without the help of an online-search-term pro, or you're going to burn money fast. AdWords is much trickier than it appears. Also, competitors such as Facebook and Twitter are breathing down the online ad market leader's neck. So this market is changing fast. Productivity factor: AdWords can really work, but be careful not to overspend. What's to love: This is our sleeper pick for Google products that also work for the small business--and the first thing you should download when you get a new computer. 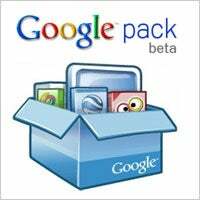 Google Pack is a free starter office suite that contains the Google Chrome browser, Google Apps, and Spyware Doctor and Anti-Virus, among other Google software, along with third-party applications such as Adobe Reader and Skype. What's to hate: Not much, really. Yes, this is a clear promotional vehicle for Google. But it is handy and gets you up and productive in just a few clicks. Surprisingly cool. Productivity factor: Easy to install and efficient, it's a great way to get Google-ized fast. What's to love: Because they're stored online, presentations can be updated on the road, and it's great for finding data in real time. Presentations also makes it relatively easy to insert basic images and videos. A template library gets you up to speed quickly, and the sharing feature lets you collect and share team feedback quickly, keeping everyone on the same page, literally. Publishing your finished product on the web or embedding it in a website is instantaneous, making it easy to reach a worldwide audience in a flash. 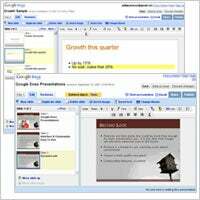 What's to hate: Google Presentations simply does not have the same level of features as PowerPoint. And for PPoint heads, this will drive you nuts. Design features are limited. And while you can open PowerPoint files of up to 10MB, the transliteration can be way clunky. Text boxes have feeble updating features, and sometimes the layouts get skewed. And be prepared to bone up on your web coding skills to get Presentations working smoothly, especially when working with multiple browsers. Productivity factor: PowerPoint 2010 has nothing to worry about. What's to love: This drag-and-drop website development tool is useful to anybody who struggles with building team-based websites that work inside your business. If you are a Wiki shop building an internal site, or are struggling with Microsoft SharePoint, Sites will save you a ton of time and money. These websites all exist within your branded Google Apps domain and are easily edited by employees, with permissions set from the main account. 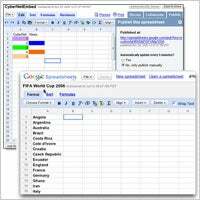 It also integrates information from other Google Apps programs well, making it a breeze to organize Google Docs, Spreadsheets and deadlines from Calendar, along with Gmail messages relevant to the matter at hand. What's to hate: Despite its flexibility, there are many other ways to develop a more effective public web space, namely Facebook, LinkedIn and Twitter. Small businesses might find Sites overly complex and just not worth the bother. Productivity factor: Don't throw away your web development tools quite yet. Google Sites can be clumsy for the tech-inexperienced small shop. What's to love: This is an attempt to reinvent telephony with the one-phone-number concept, complemented by plenty of bells and whistles. When a customer calls your Google Voice number, they get a recording while it pings your registered numbers to find you or sends it immediately to voicemail. Voice also offers transcription, message sharing, multiple personalized greetings and some spiffy international calling. What's to hate: Clearly, this is a whole lot of technology looking for a problem to solve. The ritual of business phone usage remains one of the inviolate aspects of business life. So tinkering with inbound business calls to loop in a Google-branded automated operator can be a ticklish business proposition. And there have been quality issues for international calling and transcription. The novelty can get old fast. Productivity factor: Not much. Your customers mastered the phone 120 years ago. They're not about to change their habits now. 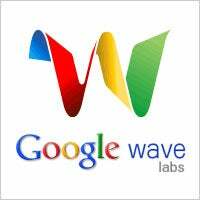 What's to love: Wave is Google's attempt to create a medium-agnostic sharing tool that lets users create real-time content in the cloud as if there was no web browser. And Buzz brings social media to Google's arsenal of products by letting users collect ideas, clips, photos and videos online and share them among a group where everyone can comment on them. Both are simply fabulous technology. What's to hate: Such cutting-edge tools require teams that understand exactly how they work; most small businesses simply don't have the time or resources to train their people effectively. Productivity factor: For Google Apps experts only. What's to love: Not much. This is Google Apps' major disappointment. Sure, you get basic spreadsheet functions and some pretty cool tricks (such as real-time updates of web data and automatic compatibility with Excel and any .xls or .cls file), but little else here impresses. Nice features include an autofill function that lets you avoid having to retype the same terms over and over, the ability to drag columns to new locations, and a streamlined copy feature that makes duplicates in one click. What's to hate: Turns out collaborating on spreadsheets isn't the holy grail some thought it was. After all, most small companies want only one or two employees managing their accounting or its sales. Also, Google Spreadsheets is downright lumbering compared to Excel, perhaps Microsoft Office's best program, particularly when running in 64-bit environments. Data entry in Google Spreadsheets can be annoyingly buggy; lines will sometimes disappear without warning. And freezing and unfreezing panes is needlessly complicated. Fans of Microsoft Excel, prepare to be disappointed. Productivity factor: None. Excel has nothing to worry about.